There comes a point when every journey must end. When a cycle has run its course. That time was Sunday at Tynecastle. Brendan Rodgers’ unbeaten domestic run has come to a halt after 69 matches without a loss. Few would have envisaged it happening in such a manner, but Celtic were diabolical. The stats will show a more even game, but the truth is that the Hoops failed to impose themselves in this game sufficiently. The conditions were poor but also exactly the same for both teams. Yet Celtic seemed to be the only ones struggling to maintain composure and footing. I don’t know if stats are recorded for players falling over. If there is then Celtic won that by a quite a long way. Going to ground was beginning to look like a new addition to the game. Why Celtic players couldn’t rectify that issue is beyond me. I’m not going to single out any one player as many Celtic fans have and continue to do. As a team Celtic failed miserably and so did the manager. They didn’t cope with the conditions and Hearts punished them with four goals and no reply from the visitors. On the officiating side of things Willie Collum certainly didn’t do us any favours contrary to the popular belief of many that he’s “one of ours”. Our Scottish media have been waiting a great many days for this result. You’d be hard pushed to miss the glee in the voices and on the faces of the pundits. As much it wrangles me I have to give credit to Hearts for causing an upset though. They didn’t just beat Celtic they got a solid result. So now the counter has been reset for Brendan Rodgers and for the better. I’m not saying that losing was good because I had hoped to maybe go a bit longer and maybe even until the end of the season. In truth this defeat had to happen. The longer things went on the greater the pressure and this invincible run was like a millstone around our neck. Celtic, despite the current side’s greatness, look tired and off the pace compared to last season’s performances. That doesn’t mean they haven’t carved out goals, assists or results, but they’ve lacked the same conviction and prowess this season. Scott Sinclair is perhaps the epitome of Celtic right now. Playing without the same verve as last season but still top of the statistical charts. In Europe progress has been made but only just. 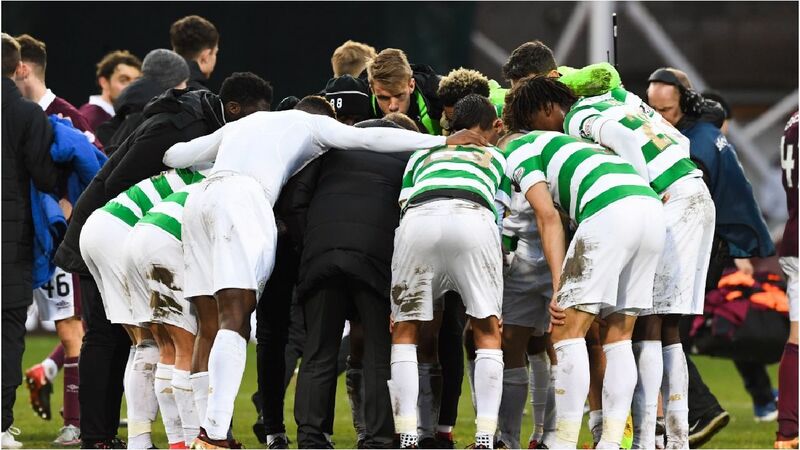 The parachute into the Europa League has given Celtic European football after Christmas, but it was a narrow escape from a group of death in a disappointing campaign that fizzled out at home to Anderlecht. Despite wiping the floor with them in Belgium they overwhelmed Celtic at home. Craig Levein claimed to have used the same tactics in order to get a result but I won’t be cross-examining him in this blog. This season we’ve seen Brendan Rodgers take some stick for Champions League performances. To take this team to the next level he will require further tweaking on the training ground and delving into the transfer market. Celtic can still improve, but they will always have limitations where money is concerned. Nobody should be under any illusions about that. How far can Celtic go under Brendan Rodgers? Further we all hope. Sunday’s defeat might just be the jolt Celtic needed. There were signs our form might be picking up, but Hearts gave Celtic a game and put that to bed. I’m not going to join the bandwagon of mudslingers within our ‘support’. Whilst understanding how hard Sunday’s defeat was to take, some of the reaction has been nothing short of embarrassing. Individual players are now being hounded out by some of the fan base. Wow, what a low point that is for the best fans in the world. Some of last season’s heroes are now done apparently. Time to go. And maybe one or two will but Celtic need to get up off the canvas. Get back in the fight and move things forward. There hasn’t been a flurry of activity in the transfer market. What has been done is that the team has been reduced to a workable size. Now we know where those weaknesses are. January should be earmarked for forward planning and how to finish off the season. As I said earlier though, it is as much about the training ground as the transfer market. These players don’t suddenly turn poor after a good season. I made the point when Stefan Johansen had an amazing first full season only to be a shadow of that in the season that followed. You don’t become a bad player over night, there is always a reason. My hope is that this invincible run coupled with a heavy schedule of games with an expectation to win all of them can now be put to bed. That a weight has been lifted with the monkey firmly off their back. Now it is time to get back in the fight and move on. There is always pressure as a Celtic player but the one we’ve just disposed of will do this team some good. The players will respond. The manager will respond. We start over on Wednesday night at Celtic Park. This is a time to get behind the team and the manager…all of us. Well Said!!! Hail Hail Indeed!!! !